Hanoi’s Catholics continue their sit-in in the gardens of the ex-nunciature, despite the government ultimatum to free the area by 5pm Sunday last. State newspapers launch a new wave of insults directed at the bishop and faithful. Some Catholics believe this slander campaign is preparing the ground for a show of force. Since December 23 the former residence of the Vatican nunciature in the capital has been the focus of gatherings for thousands of Catholics who demand the building sequestered by the government in ’59 and set to become a restraint and night club be returned. The local government has already threatened “extreme action” if the group of faithful persists in holding prayer vigils in front of the building and in the garden and if they do not desist in “undermining public order”. Fr. 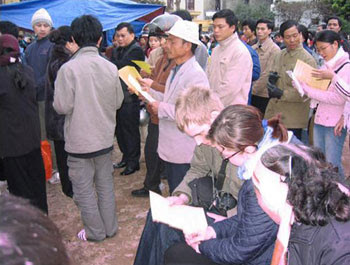 Joseph Nguyen says: “At the moment there are hundreds of religious together with many lay faithful gathered in the garden of the ex nunciature in prayer. But there are also a great many police in uniform and in plain clothes. These mix among the people taking photos and making films with video cameras. I fear an attack at any moment.